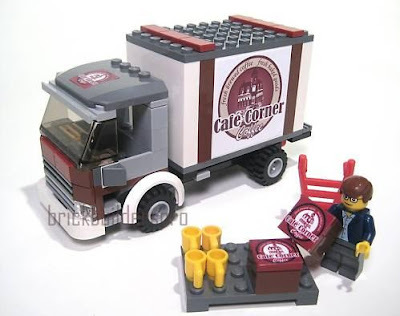 Brick Town Talk: Cafe Corner Truck on Ebay - LEGO Town, Architecture, Building Tips, Inspiration Ideas, and more! This beautiful creation could be yours. Its for sale on Ebay. I love the colours and the logo. Love it, great idea. Not so keen on Ebayers selling custom builds, not sure why. I guess maybe it's because most of the time the quality isn't there. Would love to see some sets on this site on Ebay though!